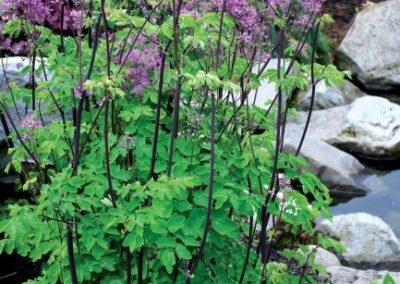 Thalictrum Aquilegifolium ‘Black Stockings’®, a new Terra Nova® Nurseries introduction. Asexsual propagation is strictly prohibited. 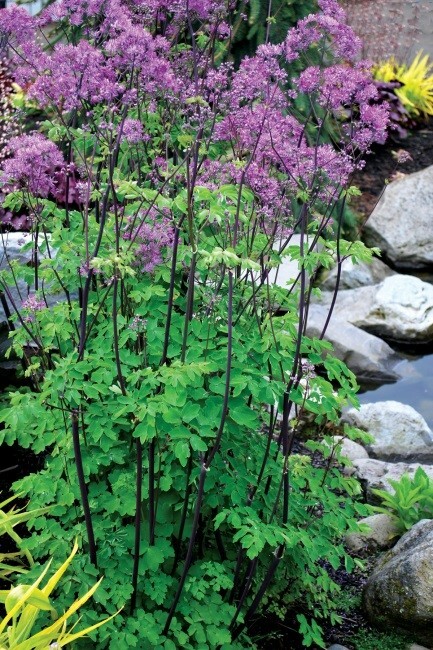 There are a few perennial plants that stand out from the crowd. 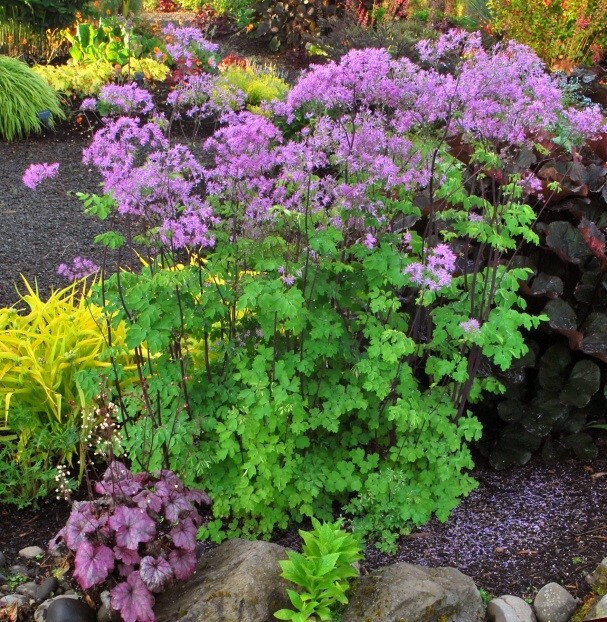 Thalictrum is a perfect example. It’s a plant with buds that unfold into perfect parasols. 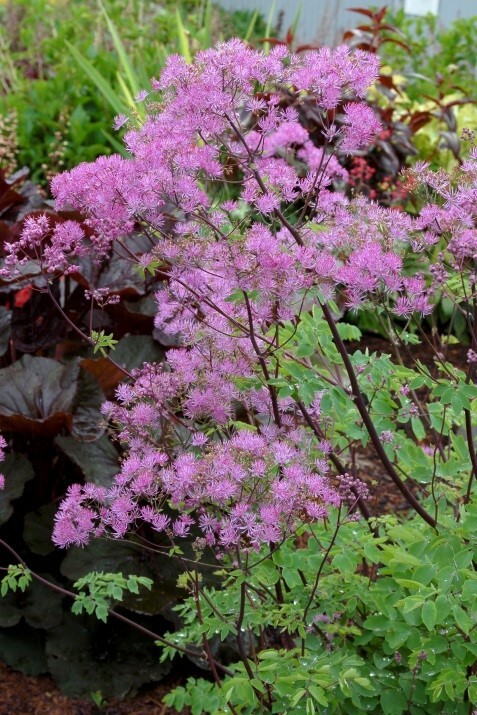 Though the genus Thalictrum is not so well-known, there are many collectors and/or ‘secret’ admirers of this plant. The merits of ‘meadow rues’, are their delicate flowers, handsome foliage and graceful habits, which are treasured by many gardeners. 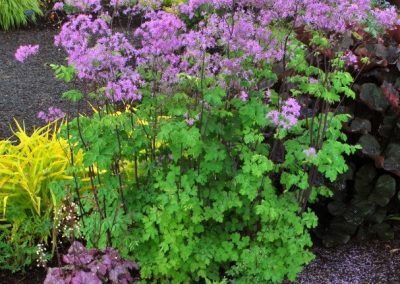 Thalictrum is a Latin transcription of the old Greek plant name thaliktron. It is not known where it is derived from and botanists are not sure as well. The name thaliktron itself is ascribed to Dioscorîdes, a nickname of Pedacîus or Pedanîus, a Greek physician(50 AD) who traversed many countries along with the Roman forces. During this period of his life, he did many botanical observations. As a result, he wrote an excellent book about medicine, which remained famous till the middle ages. 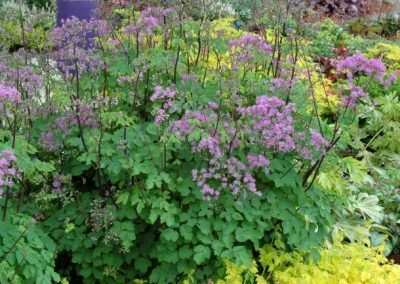 The free encyclopedia says:”Thalictrum is a taxonomically genus with poorly understood species boundaries. It is in need of further taxonomic and field research for clarification”. 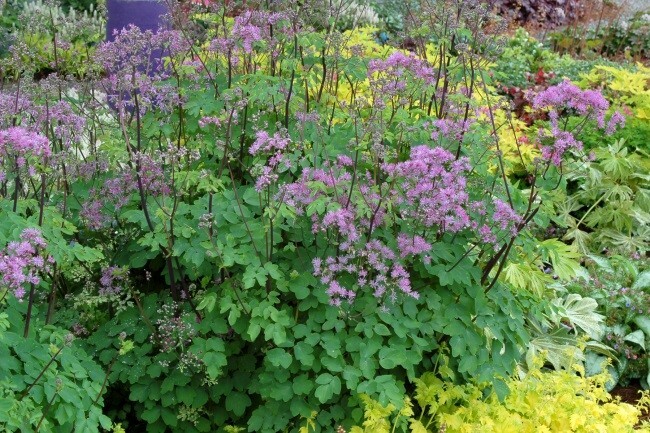 Thalictrum is a genus of about 130 perennial species widely spread around the world. They belong to the large buttercup family, Ranunculaceae. 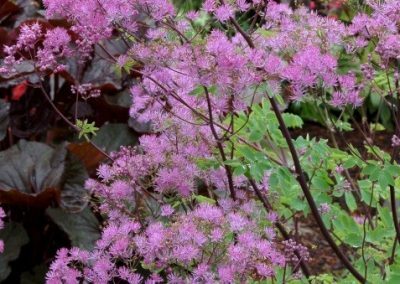 Thalictrum aquilegifolium ‘Black Stockings’® is a new variety of the popular meadow rue. It has lavender-purple flowers, held on striking, jet-black stems in spring. Each small flower is made up of tiny strands, like downy lavender-colored thistles, giving the plant a hazy, fluffy effect. The foliage is pretty too, with scalloped and lacy looking foliage. This willowy (up to 180cm tall) perennial makes a striking presence towards the back of a partially shaded border, or as a contrast to larger-leaved plants. It is tolerant of full sun and prefers moister soils. The ethereal majesty of this delightful herbaceous perennial will bring a smile to all that see it. This beauty will make a statement in any garden. It takes time to mature, but once established it will be treasured as a long-lived perennial.